Its hereby to inform you that PEC 5th 8th Class result is going to announce with an immediate effect.All students who appeared in Board exam of 5th and 8th Class can download their result by reaching on the following link respectively. All Punjab Examination Commission PEC Students of Punjab all 36 Districts now check their Online Result by entering their roll number and District Name in below Result Form. The Punjab Examination Commission PEC conducts the examination for 5th and 8th class Grade of students every year and this year, PEC 5th and 8th Class examination conducted in Whole Punjab in 1st week of the February 2019. Now PEC 5th and 8th Class Result 2019 Online Result is going to announce on 31st March. Now its Fist time PEC announced the Result in Online Format rather then PDF. Its another better step from PEC for students now they can check their result Online easily by entering their general information in Result form by Officially given. Here Please Follow the Step for Checking Your PEC 5th 8th class Result Online Now. First Choose Your Grade 5th Class or 8th Class. Then Choose Your Required District Name and Tehsil Name. At Third step please enter your roll number in correct format and Click on Search Button.Your Result will be Available. You can Check All other related Punjab Board District Wise Result Here for following districts of Punjab, Attock, Bahawalnagar, Bahawalpur, Bhakkar, Chakwal, Chiniot, D.G Khan, Faisalabad, Gujranwala, Gujrat, Hafizabad, Jhang, Jhelum, Kasur, Khanewal, Khushab, Lahore, Layyah, Lodhran, Mandi Bahaudin Din, Mianwali, Multan, Muzaffargarh, Nankana, Narowal, Okara, Pakpattan, Raheem Yar Khan, Rajanpur, Rawalpindi, Sahiwal, Sargodha, Sheikhupura, Sialkot, Toba Tak Singh, Vehari. At Gotest You can Prepare all online Test from 5th class to 12th Class Subject Chapter Wise. 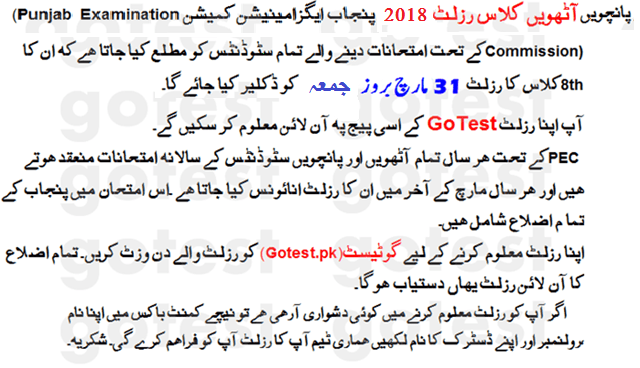 Other Test like NTS, Armed Forces Test, Intelligence Test, General Knowledge test, English Grammar Test and Pakistan Information Related Test available here for all Level of Students.